PGE is sponsoring test drives at Wilsonville event that is part of National Drive Electric Week. Anyone who test drives an electric vehicle at a Saturday event in Wilsonville will have a chance to win $5,000 toward the purchase or lease or a new or used EV. The event is sponsored by PGE and by Oregon Electric Vehicle Association, with particpation by the City of Wilsonville. It is part of National Drive Electric Week, which is intended to raise awareness of EVs and their benefits to a clean energy future. Drivers can test 12 new EVs and a selection of used ones. The test drives entitle them to take part in a raffle for the $5,000 prize, with the winner being announced at 2:30 p.m. by Wilsonville Mayor Tim Knapp. The events starts at 10 a.m. on Sept. 15 at Lowries Marketplace, 30299 S.W. Boones Ferry Rd. in Wilsonville. Dave Robertson, PGE's vice president of public policy, will also speak. "The event is a great opportunity for people to test drive a range of EVs, get hands-on experience with the vehicles and have their EV questions answered by industry experts. 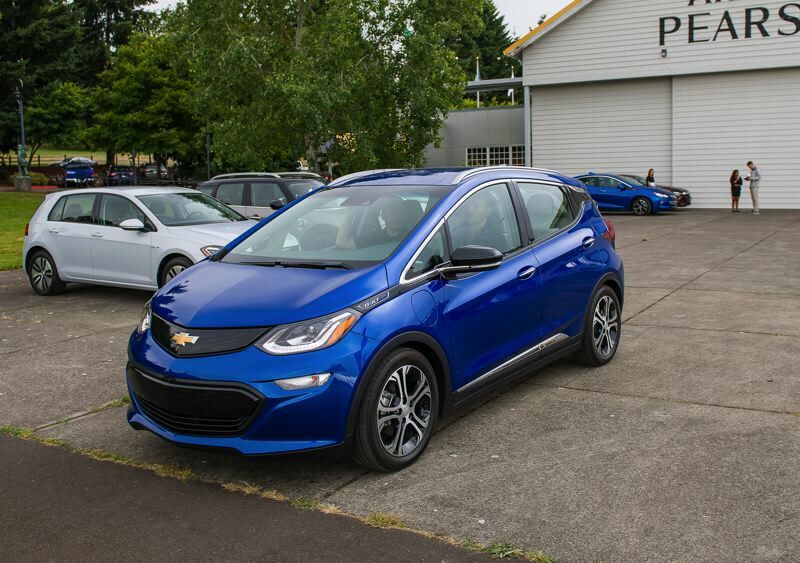 EVs play a critical role in decarbonizing our transportation system and will help advance Oregon's transition to a clean energy future," says PGE, which has long supported EVs and has the No. 1 voluntary renewable energy program in the U.S.
New vehicles available to drive include the Audi A3 e-tron, BMW i3, Chevrolet Bolt EV, Chrysler Pacifica Hybrid, Fiat 500e, Honda Clarity Electric, Honda Clarity Plug-in, Kia Niro Plug-in, Mini Cooper Countryman Plug-in, Mitsubishi Outlander PHEV, Nissan LEAF. Pre-owned vehicles include the Nissan LEAF, the Kia Soul EV, the Chevrolet Spark EV, and more. Most qualify for federal and state incentives that reduce their purchase prices or lease costs. There will also a drawing for a 3-day extended test drive of a Tesla Model S courtesy of Platt Auto. Several Tesla owners are expected to bring their vehicles to the event for possible private test drives. Also on display will be a 2019 Jaguar I-Pace, the company's new all-electric crossover SUV. To register for test drives and learn more, go to tinyurl.com/yagbxufp.